After the prison doors are scheduled to clang shut on Kerik May 17, the media need to re-examine how federal authorities can railroad someone like Kerik into a guilty plea this way. The procedures violate gut-sense fairness, albeit probably not in a legally enforceable way. Who can take on the government, after all, if a defendant no longer dares? U.S. District Judge Stephen Robinson approved unusually aggressive prosecution tactics, such as depriving the defendant of lawyers by designating them as witnesses. Robinson even suggested last fall to the defense that Kerik hire a friend of the judge's in case another change had to be made to remove conflicts. Meanwhile, the judge was crippling the defense by imprisoning Kerik pending trial and berating him in open court as exemplifying “arrogance,” and worse. On Nov. 5, Kerik gave up by admitting to eight felonies. By then, the defendant had spent millions on his defense only to conclude he couldn’t direct a successful defense from prison with his money running out, and still win three trials in two cities fighting on all fronts. As a reader advisory, my views emphasizing procedural unfairness are quite different than conventional wisdom about the case. Most coverage of Kerik’s sentencing does little more than describe the term that the judge imposed, as evidenced by the two-sentence AP treatment in the print edition of the Washington Post Feb. 19, expanded online here. That’s understandable. Even Kerik and his team cooperated in what was, in effect, a choreographed public flogging that illustrated the government’s commitment to rooting out corruption, no matter how high the official, and the defendant’s acceptance of guilt. His plea admitted eight felonies. Three counts were for income tax violations and a false bank loan statement. Five were for misleading White House officials when he said there was nothing in his past that would be embarrassing if he were nominated to Homeland Security posts. But bear with me as I offer an additional perspective based on my research about Kerik and many other federal investigations of white-collar defendants nationally. Admittedly, I’ve had the luxury of a longer format and research cycle than most colleagues. So, my contrarian view here is to encourage more research, not criticize others with tight deadlines or similar constraints. Let’s accept at face value Kerik’s admissions that he committed crimes and disgraced himself. Even so, Kerik was largely forbidden by pre-trial rules from protecting his reputation from hundreds of negative news stories, many of which alleged mob connections that the prosecution waited until after his guilty plea to refute as unmerited. Meanwhile, my investigation reveals that Kerik also faced enemies in the private sector who secretly funded a smear campaign against him for advantage in various potential business relationships and political intrigues. More generally, abusive tactics are all too common nationally in federal white-collar crime prosecutions. Gross abuses have occurred in politically tainted prosecutions of former Alabama Gov. Don Siegelman and famed Pittsburgh coroner Dr. Cyril Wecht, among others whom I’ve been researching. Experts further document the problems in thorough, non-partisan recent books. One is Harvey Silverglate’s Three Felonies A Day: How The Feds Target the Innocent. Another is Timothy Lynch’s In the Name of Justice. A study by University of Missouri professor Donald Shields shows highly suspicious patterns of political prosecutions the last decade. These include the federal prosecution of the Democrat Siegelman, which has important parallels to the prosecution of Kerik, a Republican. We need a more open, accountable process that can help federal authorities focus taxpayer resources on the most serious corruption, which is crippling our economy. Government waste is readily apparent to anyone with an investigative background in Washington, DC. I work almost overlooking Jack Abramoff’s now-closed restaurant next to FBI and Justice Department headquarters, and I often hear professionals in multiple fields talk about rampant abuses in government that are seldom examined by any official body despite dire consequences for the public. For these kinds of reasons, I’m helping organize a reform effort through the Justice Integrity Project, a new non-partisan, non-profit organization. The public, not just a defendant, loses when DOJ’s power is abetted by judges who think their job is to push the accused through the system with the current 95 percent federal plea-bargain rate instead of insisting on basic fairness. The project’s goals are described on its Web site, with ongoing updates to be added shortly. Kerik’s hard-luck childhood included abandonment as a toddler by his mother, a prostitute who was later murdered. Kerik dropped out of high school to enlist in the Army, and later created an impressive career in international security and other law enforcement work. He took a pay cut in 1986 to become a policeman in New York, and soon won many awards for valor and other achievements, including a lead role in cracking a huge cocaine ring at great risk to his life. New York Mayoral candidate Rudolph Giuliani hired Kerik in 1993 to be his driver and bodyguard. As mayor and a Kerik mentor, Giuliani promoted Kerik to jobs that included running the nation’s largest local corrections system and the world’s largest local police department, with 55,000 employees. The two Republicans also shared in acclaim for huge declines in the city’s crime rate, and for their leadership following the 9/11 terror attacks in 2001. These accomplishments became themes in Kerik’s best-selling 2001 autobiography, The Lost Son: A Life In Pursuit of Justice. Kerik partnered with Giuliani in a lucrative security consulting business after their retirements from government. Kerik earned $6 million also from stock options as a director at Taser International, Inc. The Taser options made news after the Bush administration nominated Kerik in 2004 upon Giuliani’s recommendation to become Homeland Defense secretary. Some questioned the payments even though they were legal and the media only sometimes scrutinizes finances of such Cabinet nominees. Mike Leavitt, former CEO of his family’s Leavitt Group insurance brokerage, was nominated in 2004 as Health and Human Services secretary, for example, with his family business rarely mentioned in any news coverage despite the obvious impact of federal health policies on the insurance industry. Other allegations popped up about Kerik finances, such as failure to pay nanny taxes. Kerik withdrew from Cabinet consideration after a week of adverse news reports. Following thousands of messages wiretapped from Kerik’s cell phone in 2005, state officials accused him the following year of obtaining renovations at his Bronx coop apartment that were worth far more than Kerik paid the contractor. The contractor was also seeking city work despite a reputation in some quarters as having organized crime connections. 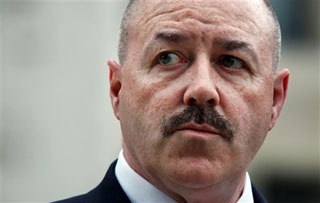 The state charges prompted many news articles suggesting that Kerik was linked to crime figures despite his long-standing denials that he knowingly tried to help anyone with such a taint. Kerik thought he disposed of the state charges by pleading guilty to state misdemeanor ethics violations and accepting a fine of $221,000. But in December 2008, federal authorities retooled the state charges with a federal indictment that added claims of tax evasion, loan fraud and misleading the White House. A New York Times snapshot of the case is here. Kerik planned to respond to the federal charges at trial by arguing that he paid what the apartment contactor asked, and honestly believed the contractor wasn’t involved with the mob. In this view, Kerik’s tax disputes, loan application lie that caused no loss to the bank, and any embarrassment for the White House were non-criminal matters. Like many other officials, he wanted to think they are akin to the never-prosecuted nanny tax problem of the Clinton nominee for Attorney General Kimba Wood, or unpaid taxes by Obama Treasury Secretary Tim Geithner (in charge of the IRS) and House Ways and Means Chairman Charles Rangel (D-NY). Prosecutors obtained Kerik’s pre-trial imprisonment by successfully seeking that the judge revoke his $500,000 bond on Oct. 20. The feds claimed that Kerik tried to influence New York’s jury pool by letting a lawyer violate judicial orders by sending confidential information to the Washington Times. Prosecutors sought Kerik’s immediate imprisonment after Feb. 18 sentencing as a flight risk, even though he has been living at home with his family under heavy bond and electronic monitoring with no passport, and federal guidelines discourage keeping prisoners in holding cells as unduly expensive and punitive. Prisoners typically endure up to three months in local jails before assignment to a prison, which would be especially harsh for Kerik since he’d be in protective isolation almost the entire time because of his past as a policeman and prison warden. The judge ruled that Kerik is not dangerous or a flight risk, but for the most part has endorsed prosecution tactics. Robinson, who had worked as a federal prosecutor in the 1980s under then-U.S. Attorney Giuliani, indulged in a verbal tirade against the defendant Oct. 20, shortly before scheduled trial. The judge called the defendant a “toxic combination of self-minded focus and arrogance ... that leads him to believe that the ends justify the means ... that rules that apply to all don't apply to him in the same way.” This was raw meat for the New York media, of course. After that, the judge then revoked the defendant’s $500,000 bond for, ironically enough, attempting to influence the New York jury pool via the never-published story in the Washington Times. Accounts of Kerik’s guilty plea are here from Time and from here from longtime New York police columnist Len Levitt. The judge referred so often to Kerik’s failure to admit his guilt before Nov. 5 as to raise a question how defendants anywhere are supposed to assert their right to trial if they are accused at sentencing of obstruction of justice if they ultimately change a plea to guilty. Whatever Kerik’s character or crimes, the DOJ and judges have unique obligations in our system to proceed in due proportion to the circumstances. Let’s review more of the news coverage so far. As indicated by a glowing feature in Newsmax, Kerik continued to receive some positive coverage long after his state plea and had a number of stalwart friends from law enforcement standing by him at the sentencing this week. By contrast, some on the left have been eager to scorn the defense and its supporters, such as Newsmax. Prosecutors also made the point that those in the general public injured by official corruption cannot be expected to attend hearings. But there’s also been common ground in commentators. Fox News host Geraldo Rivera argued on the Don Imus radio show that both the judge and prosecutor have acted outrageously against Kerik. Rivera said the judge should have recused himself for attacking the defendant personally. My view is that the judge failed to protect Kerik’s ability to mount a defense. We’re all losers for this lack of fairness because all freedoms depend on justice in the courts. And for those who enjoy seeing Kerik suffer because he’s a prominent and now-disgraced Republican, let’s remember that Big Brother-style government is the issue here. It’s not a good idea to applaud air bombing of neighbors. At sentencing, defense counsel Michael Bachner summarized Kerik’s many honors, including 30 medals from New York City alone, plus awards from President Reagan, the Queen of England, support from colleagues or concerned citizens. One letter praised Kerik for improving ways for imprisoned mothers to bond with their children. Another was from former police colleague Hector Santiago, who said Kerik had saved his life by drawing gunfire away during a shootout when Santiago was seriously wounded. The judge then interrupted to steer discussion to why Kerik might deserve a longer sentence than the 33 months in federal sentencing guidelines as the top of the range for a defendant in Kerik’s situation with those guilty pleas. Kerik’s attorney had been seeking 27 months, the lowest end of the guidelines and the minimum term negotiated with the prosecution in the plea bargain. Defense counsel begged the judge to consider along with Kerik’s guilty plea his accomplishments in a long career in which he’d risked his life repeatedly. Bachner noted that judges frequently recognize civic service in sentencing public officials, such as the 10 months that former Connecticut Gov. John Rowland served on a federal charge after accepting illegal home renovations from contractors doing business with the state. The judge responded that federal guidelines cannot envision someone with Kerik’s such high status and failure to admit his guilt at an earlier stage. Also, the judge noted that he’d helped prosecute Rowland, and so the governor’s lenient sentence was a personal sore point that he didn’t want to hear about again. The judge further personalized his sentence for Kerik by stating that he couldn’t on a judge’s salary afford the kind of house, vacations and overall lifestyle that Kerik enjoyed both as government employee and in the private sector. Some in the media or public comments have suggested that Kerik must have done something far worse than the formal accusations in the indictment - and so he deserves whatever fate awaits him as a former law enforcement official in prison, with his life either at risk or his movements tightly restricted. The same argument was the main criticism in the public comments section here of one of my most recent Huffington Post columns on a similar case. But our criminal system is supposed to resolve formal accusations via standard procedures, not word-of-mouth grapevine. If Kerik did something else that’s horrible he should be charged with it. In my own reporting, I’ve interviewed a private investigator hired years ago to compile an intelligence dossier about Kerik to be used to pressure him. Also, I know a reporter who published damaging material about Kerik and his purported ties that were obtained from the investigator, and know two other journalists to whom material was shopped with varying degrees of use. Funding such private research is an investment, and so the ultimate stakes are presumptively high also. But I’ll leave out any specifics since my goal here is not to float new material, but simply to mention how “insider” material can get shopped around about major public officials. So, official investigations need to be both thorough and fair. In some ways, the Kerik prosecution seems like the federal prosecution that’s driven Alabama’s former governor Siegelman out of politics via criminal charges. As I’ve described here and elsewhere: Republicans for years arrayed a federal-state team of prosecutors, FBI agents and IRS agents headquartered at Maxwell-Gunter Air Force base to investigate Siegelman, his state’s most popular Democrat. They ultimately convicted him in 2006 during his second trial. Since then, Obama’s Justice Department has taken a number of steps to thwart Siegelman in appeals and to obtain 20 additional years for his prison sentence. In this way, DOJ has so far maintained its winning track record, and soothed the nerves (doubtless frayed) of federal personnel and their political backers who railroaded Siegelman and the donor into prison for lengthy terms. But Obama’s DOJ has also reinforced public fears that the feds are oblivious to any accountability for spending vast sums whose results in the case primarily seem to be notoriety for human rights abuses and enhanced Republican political control of Alabama. Long before Kerik’s guilty plea Nov. 5, the former police commissioner sent a sympathy note to Siegelman saying he’d witnessed for five years much of what Siegelman and his family had experienced. “Keep fighting and never give up,” Kerik wrote Siegelman, one of whose friends showed me Kerik’s email last year. By then, Kerik was running out of funds for lawyers. Here is a story about his first attorney team to be forced off the case as potential witnesses. Kerik was forbidden also to contact the media on matters related to his case. He created Twitter and Facebook postings, and maintained The Kerik Group site. But this is no match for the power and majesty of the U.S. government. Checkmate, game over. For these kinds of reasons, the Justice Integrity Project I’m helping start will assist federal defendants and their families in the most disputed cases to share their stories with independent journalists, academics and local concerned citizens. This will foster a way to engage the attention of courts and Congress, most of whose officials are far too complacent these days. As a young newspaper reporter, I was inspired by then-fresh memories of watching on Broadway the incomparable Robert Ryan portray in The Front Page the cops-and-courts shenanigans in days of yore. Whatever Kerik’s crimes or misdeeds, he got railroaded through the legal process despite spending millions. That’s bad for all of us. Let’s dig deeper into his case, and others like it. Maybe we should waterboard the truth out of him. 9.) Henry salcido also told me at one point he didn't care If I was innocent or guilty I should take a deal. 17.) the second search warrant had a type -o- error and the name on the search warrant was Walter Eugene Farris a guy that I don't know and neither did any one els that lived in our home and he had never been in our home. 11.) the city of la mirada offered to buy our home at cost saying under the condition I couldn't live in la mirada nor Whittier. 16.) our car had also been impounded 3 to 4 times every time officers said just tell us were the drugs are we won't impound the vehicle and every time I was honest by saying I don't have any drugs they impounded it any way. 18.) during the proceedings of the case no one had any idea I studied law I even represented my self in the federal courts I studied criminal and civil for about five years including 42 u.s.c $1983"s torts writs civic codes ethics even the CCR title 15 rules and regulations.